So after failing so spectacularly in Q3 I decided that I would be a little more realistic for my Q4 goal setting. I'm sure that something else will crop up but here are the seven projects that I'd like to get finished before the end of the year, in the order that I intend to tackle them. 1. Anwen's quilt. Quilt top ready? Check. Backing ready? Check. Wadding cut and ready? Check. Binding ready? Check. Just (ha) need to get this quilted and bound. Please, don't look too closely at the piecing! 2. Birthday pouches. I'm really ashamed to say that three months after their birthdays Anwen and Esyllt are still waiting for their pouches! The main reason why I stalled is that the pen that I used to mark their names bled and I couldn't remove it. However as I was looking through my WIP ready to compile this list I noticed that the blue marks had vanished so I really should get on and finish these. 3. Cian's quilt. As soon as I was told that my cousin had had a little boy I got out an Apple Jacks charm pack and cut some solids to match. I've noticed recently that the main reason why I'm not 100% in love with the quilts that I'm making is because they don't have the same level of negative space as the quilts I admire on-line do so I'm going to add quite a lot of white in a D9P based design. Solids left over from Marged's quilt. 4. Oakshott quilt. I've lost count of the number of times I've read on-line that Oakshott has to be seen in the flesh to be fully appreciated so I held off buying any until I'd had the chance to see some with my own eyes. That chance came at the Fesitval of Quilts where I made a beeline for the Oakshott stand and fell in love! It took me quite some time to decide on which collection I was going to go for but eventually decided on Impressions and limited myself to a charm pack. I then scurried of to the Simply Solids stand and the lovely Justine (along with Lu and Nat) helped me choose Essex yarn dyed linen in Flax for the background. I have a plan and have already started cutting the linen. 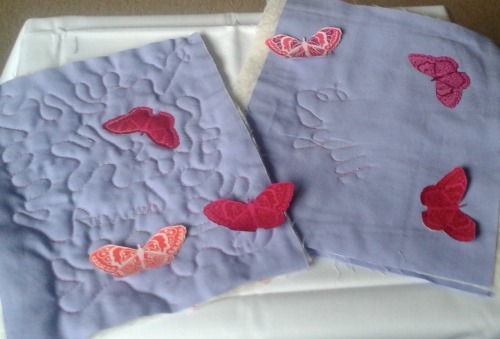 I see very simple piecing and simple straight line quilting in the hope that the Oakshott will shine! 5. House quilt. This quilt hasn't progressed since my Q3 goal setting post. 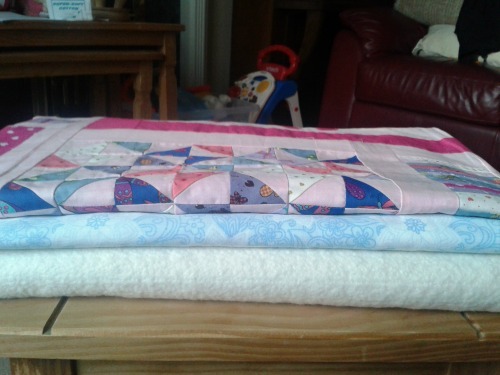 Well that's a lie, I did cut the wadding and backing whilst I had the floor clear to cut the wadding for Anwen's quilt. I'm stalling as there's a very large blank canvas on this one and there's no way that the piecing (or the lack of it) is going to hide and quilting mistakes. Must. Get. This. Finished. Before. Baby. Turns, Eighteen. 6. Liberty Bag. I may have mentioned before that a quilt shop (sells quilts not fabric!) in the town where I work sometimes has some vintage Liberty for sale. I have told Jen, the owner, that she's not allowed to put any more out in the shop as my husband is very close to killing me for spending all the housekeeping on fabric. She won't listen. I think that this comes from a sample book. It's home dec weight and just big enough for some fussy cutting which I'm going to pair with some cream sketch and hopefully turn into something that resembles a bag. I've ironed some interfacing onto the sketch and now need to bite the bullet and start cutting the liberty. So there we have it. Seven goals. I'd like to think that I'll get them all done and dusted before the end of the year but as the post title says let's be more realistic. My real goal is to make some progress on each of these projects but I'll be really upset with myself if I haven't finished Anwen's quilt and the pouches before the year's end. You can do this Catrin! Once you get the first one ticked off the rest will fall like ninepins. Thanks for visiting. Please leave a comment as they really do brighten up my day. I'm pretty good at replying to comments but if one slips through the net I apologise - I'll try harder next time! Hi. My name's Catrin and I enjoy sewing (mainly quilting) and baking. I have two gorgeous little girls, a baby boy and an amazing husband that puts up with me for some reason! By the way Patshyn Catrin means Catrin's Patch which just happens to (sort of) rhyme in Welsh!